Starting in October 2013, BASF will offer its customers a product and service package under the name Ultracom that encompasses thermoplastic laminates and tapes combined with compounds for overmolding as well as a comprehensive engineering support component. The basic idea is to provide an integrated development platform that starts at the concept phase, continues through design, simulation, processing and part testing, and ends in efficient volume production at the customer according to Dr. Reinhard Jakobi, Head of Processing Technology, Engineering Plastics Europe, at BASF SE (Ludwigshafen). The support component of the Ultracom package encompasses design assistance in the form of the Ultrasim simulation tool, use of a newly installed manufacturing cell for composite part production as well as extensive and expanded capabilities for part testing at BASF. Since March 2013, this equipment has been used to produce multifunctional composite test specimens by means of the in-mold forming/overmolding process. According to BASF, this process represents the most promising approach for production of structural components from laminates and injection molding compounds: forming of the laminate (draping or in-mold forming) takes place in the mold, and is followed by overmolding. Further if the laminate is pre-heated outside the mold, the cycle time is considerably shorter as the result of parallel process steps. This, however, requires reliable handling and positioning of the heated laminate insert, which is no longer rigid. In order to explore all aspects of composite part design with this new production cell, BASF has also developed its own test part: the so-called CIFO part (derived from “combination of in-mold forming and overmolding”) is a multifunctional test specimen for investigating and jointly developing continuous-fiber reinforced composite parts for volume production. It measures about 40 x 40 cm, has a height of 4.5 cm and consists of 1.5-mm-thick formed laminates as well as up to 3-mm-thick molded-on functional elements such as ribs and edges. With its approximately 20 individual functions, it allows the characteristic properties and problems associated with actual composite manufacturing to be replicated. Special features of the part include overmolded edges, long flow paths to fill the edge and punched or formed holes for use as mounting elements. Additional elements are a rib array for special crash investigations, a variety of different ribs/wall thickness transitions between the laminate and overmolded material, stitch elements (locations in the laminate through which material is injected), and a carrier with ribbed U-profile. The CIFO parts produced require no further processing, they are completely overmolded and no post-molding finishing operations are needed. The mold for CIFO part production fabricated by Georg Kaufmann Formenbau AG (Busslingen, Switzerland) is highly flexible through use of interchangeable inserts in order to investigate the limits of forming a laminate. The mold is further designed to allow simple and precise handling of the laminate by means of a clamping frame: These clamping frames release the laminate in a controlled manner as the mold closes. 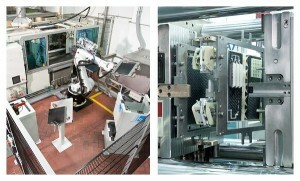 In addition to conveyor belts, the magazine for the cut-to-size laminates and a manual loading station for special-cut inserts, the manufacturing cell set-up in Ludwigshafen for near-real-world production of continuous-fiber reinforced thermoplastic composite parts consists of: a six-axis robot as central element; a station for automatic insertion of the laminate into the clamping frame by the robot; and an infrared heating station (all from FPT Robotik GmbH & Co.KG (Amtzell, Germany) including automation and programming); as well as a hydraulic injection molding machine (a KraussMaffei KM 300 1400C2, 3000 kN clamping force) with controls for the hot-runner system and core pulls as well as interfaces to the robot and temperature units. The process sequence in the new composite manufacturing cell offers a high degree of parallel operation for the shortest possible cycle time. This means that three clamping frames for laminate handling are used simultaneously in the cell. The steps through which an individual clamping frame passes include: inserting the laminate into the clamping frame; heating of the thermoplastic laminate; loading of the clamping frame into the injection mold; forming (draping) and overmolding of the laminate; removing the clamping frame and finished part; and placing the part on the conveyor and the clamping frame on the laminate insertion station. While one of the clamping frames is in the injection molding machine, the second frame is holding the laminate in the IR oven (up to 250°C) and the robot is inserting a new laminate in the third frame. 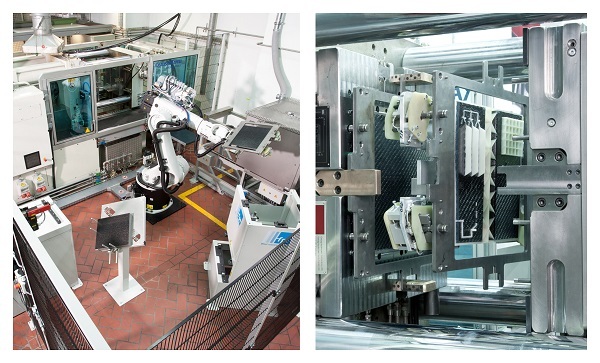 The robot inserts the laminate into the clamping frame automatically with high precision and reproducibility. The gripper arm is equipped with suction cups, giving it the ability to insert the laminates carefully and remove the parts in addition to handling the clamping frame. Numerous trials have demonstrated that cycle times of one minute can be achieved with this manufacturing cell, the equivalent of a standard injection molding process. Thus, a major prerequisite for use of the process in high volume production has been satisfied according to BASF. A wide range of test equipment is available for experimental investigation of test specimens, samples and new composite parts. A new computer tomography (CT) system now allows material samples, parts and connections to be tested in a completely new way: CT permits detailed observation of the inner structures and properties of composites in a nondestructive manner like no other technology. Additional testing capabilities include long-term exposure to temperatures, climates and liquids as well as experiments with quasi-static, dynamic or sudden forces and internal pressures. Individual part structures can be subjected to targeted tensile, compressive, flexural or torsional loads – at different temperatures. In addition, the testing laboratory is responsible for investigating and optimizing joining technologies such as welding, adhesive bonding or bolting – an aspect that is indispensable for multi-material design of thermoplastic composite parts. In conjunction with simulation and part testing, the new manufacturing cell is now available for customer-specific projects. In addition to the mold, the gripper and clamping frames must be designed for the customer’s particular part and the robot motion modified accordingly. At present, the majority of work involves laminates as the semi-finished product. By the time of the K 2013 show in October, unidirectionally oriented tapes consolidated into sheets will be available for use.